I’m excited to bring you this podcast/ blog episode on the best of creating a home for people with intellectual/ developmental disabilities (IDD). 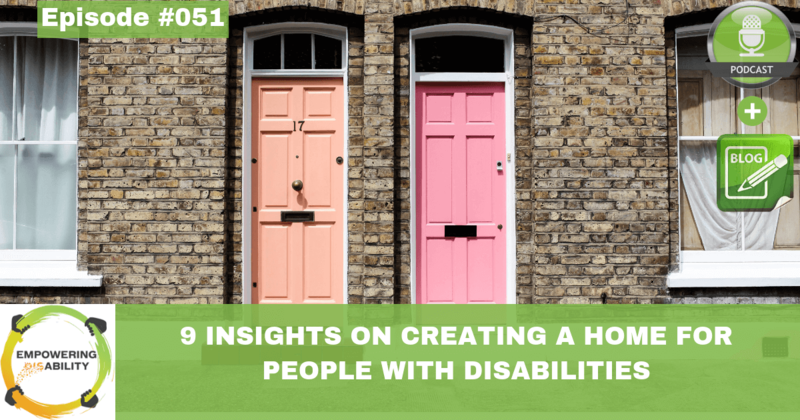 In this episode, I have compiled audio clips that provide insights from 9 interviews I’ve completed with guests on creating a home for people with disabilities, along with my insights as a family coach. My desire to share this with you also comes from the experience of supporting my sister (Sarah) to create a home of her own over the last year. On July 4th 2018, Sarah moved out of our parent’s home and became roommates with me. This is Sarah’s first time living in a home of her own. There has been many events along the way that have come with incredible growth for everyone in our family, and support network. This episode is a collection of insights shared by 9 guests who I consider as experts in the area of creating a home. Each guest has either directly been involved in creating a home for people with disabilities and/ or has evaluated housing services for people with disabilities. I’ve constructed this episode in a way that shares what I believe will lead to the best outcomes for people with disabilities and their families. You may agree or disagree with the perspectives shared in this episode, however, I invite you to consider these perspectives to determine what is true for you. You will notice that I am using the language creating a home vs housing. I do this because housing refers to the physical building, and the physical building is only one component of what must be considered when creating a home for a person with a disability. When creating a home we must also consider the person’s other needs; their supports, their relationships, and what they will be doing once they are living in the space, etc..
Additionally, I have updated the ‘Creating Your Home Workbook’, to include these insights and perspectives. The original workbook was downloaded over 100 times, and I’ve sent the updated version to those of you who have already downloaded the original workbook. This workbook is designed to guide your thinking to create the best home for an individual with a disability, and to encourage you to take the first steps to make this home a reality! Claim your FREE Creating Your Home Workbook! In many areas around the world there are long waiting list for people with a developmental disability in search of government supported housing. As you continue to read, I am going to outline that government supported housing is actually not the optimal solution for an individual with an intellectual/ developmental disability (IDD) in the majority of cases. You are better off designing and creating an individualized home that meets the desires and needs of the individual, which provides them control over their life. 1) The individualized one person at a time option is the best option for people. Group Homes are based on the assumption that people with disabilities should live together. We [everyone else] chose to live with people we are compatible with. Group homes are forced shared living, and this often creates a stressful living situation. Investment in group homes creates the idea that it is the only option for people. Individualized one person at a time is much better because it gives you much more choice. The group home option is no longer at the leading edge. It is a dying service model. Many jurisdictions have a freeze on the growth of segregated living across the globe. 2) The people living in group homes want a home of their own. “…finding out people didn’t want to live in group homes started with a survey. The survey asked the question, ‘Does everyone like where they are living?’ Everyone said yes. It was odd to ask 120 some folks a personal question and get the same answer. We then re-worded the question to, ‘How do you want to live?’. And, the flood gates opened. People answered 1 of 3 ways, from most dominant to least; 1) I want a home of my own, 2) people wanted a job (most people were in day programs or workshops), and 3) friendship and romance. As I reflected on my conversations with Lynne Seagle and Michael Kendrick, I thought about what it would look and feel like to live in a group home. I would be forced to live with people that I don’t know, and many of my freedoms that I enjoy would be taken away. I wouldn’t always be able to do what I want to do, when I want to do it. I’d lose control of who is entering my home. This sounds terrible, and it is. Now to help you think about this further, there are similarities between group home living and living in a nursing home, or retirement home. When you think about living in a nursing home or retirement home do you get excited about the experience? An important point to make here is that it is the model and system of group living that is oppressing people, not the people working in these models. The people are typically some of the most kind and caring people in the world. It is the model and system we need to think differently about. 3) Creating a home is about building a life, the house is only part of the picture. Ron shares, the most significant example of creativity he has seen is building partnerships. The community can provide the best solutions. Not just because you can mobilize financial resources, but also because you can develop a wealth of opportunities (educational, social, employment), and this is incredibly important. The house is an important part of the picture, but it isn’t the whole solution. Community connections improve quality of life, but the government can’t do this, we have to do this. I agree with Ron’s comments that many people do hold the assumption that ‘Housing’ for people with disabilities is a government responsibility. This is the mindset that many of us continue to hold and it is perpetuating the ‘crisis’ state many families find themselves in. I disagree that creating a home is fully a government responsibility. Here is the reason why… When we [families] hold the assumption that the government is responsible for housing for our loved one with an IDD we give away the power that we have. We can put ourselves in a helpless state, or victim state. When we have hold this mindset that the government is responsible we accept the menu of sub-optimal options that the government provides us, and this puts us at the mercy of long waitlists, in many jurisdictions. And, this is a waitlist for sub-optimal options! If we hold the mindset that the government is responsible for creating a home for our loved one we are at the mercy of the government, and we give up our control. The good news is that we can take our power back. If families are feeling like a victim of a ‘housing crisis’ [i.e. you are waiting for government solutions], I invite you to consider making a choice to become a creator and to take your power back. In other words, the idea here is an invitation to take an active role in creating a home, vs a passive role waiting for a sub-optimal government solution. On the flip side of this point, I agree with Ron in that we need to keep advocating to the government that more funding is needed to support our families in implementing/ funding our one person at a time solutions to creating a home. I believe Universal Basic Income (UBI) is a possible solution to the poverty situation that many people with a disability face. A realization that I have come to is that, the government isn’t going to solve our problems, but they can be a part of the solution. 4) Give people their own front door, and separate housing and supports. Chris also shares the Activate Model they have been piloting, which considers 8 different domains in each person’s life; 1) Physical health and wellbeing, 2) Communication and social interaction, 3) The physical environment, 4) Skills, 5) Relationships, 6) Service Staff, 7) Service Management, 8) Wider organizations. [Again, the physical environment (the house) is just a component of the solution.] The early results of this model in practice resulted in a 60% reduction in challenging behaviour, and an increase in satisfaction for support staff. If you would like to learn more about the research visit the Dimensions UK website. 5) Housing is a Community Issue. (Janet Klees has been involved in the lives of people with disabilities, their families, and allies in community for over 30 years. Currently, Janet is the Executive Director Durham Region Family Resources and Supports. Janet is the author of three books which are directly rooted in her experience with families, (We Come Bearing Gifts; Our Presence has Roots; Deohaeko Decades). 7 recommendations from Durham Region Families for for all of us (Government, organizations, and families) to think about as we work toward creating a good life for people with disabilities. 1. Home, housing and support are 3 different things and must be thought of separately. 2. Most housing challenges are affordability, not disability. 3. People with disability contribute to their communities, they are not a burden. 4.Getting good housing and support doesn’t mean taking away the individual’s control of their life. 5.Providing renovation dollars allows families to be creative with their current home today (stabilize current situation) and allows for flexible housing in the future. 6. Stop funding congregated mega projects for people with disabilities, and disabilities / seniors. Commit to typical housing options and neighbourhoods. 7. Where there are families that are willing to create a home in community the government needs to support with resources. These are cheapest, most effective models, and they are currently the least funded [in Ontario, Canada]. 6) A coach or independent facilitator can support you to create and implement your vision for creating a home (and a life). In episode #031, Jessica shares that she supports families by helping to figure out what is best for the individual. Her organization starts with the belief that people can live in the community, and that they have the resources and readiness to make it happen. In other words, they start from a place of capability and abundance, which fuels us as creators! Jessica takes a person directed approach and works directly with families in the Waterloo Region helping them to take this new mindset, and she facilitates the family through creating their vision for housing. Once the vision is created Jessica helps the family to think about what resources the family already has, such as, friends, community, support, and financial. Then they will think about and take the next steps are to bring the plan to life! Marg shares that people are going on the waitlist [for housing in Ontario, Canada] without thinking, talking, and planning what an ideal home looks like for them. (Note: This is exactly what my family did at the start of our housing search for my sister. Your family is not alone if this is the situation you are in currently.) What works well is for families to come up with a vision of what would be a good home in community. What kind of building do you want to live in? What supports will be needed for your home? Also, in Episode #013 Marg shares the story of 3 individuals that her organization supported to create their home. I also share my previous experience of living with my friend, who has a disability. These stories might just give you some ideas and I recommend you listen to this episode! 8) No one can tell you the right answer. You have to figure it out for yourself! Where do most citizens tend to live in your community? What are the barriers the barriers to living in ‘ordinary’ housing? Are they actually barriers? Keenan also shares that he will guide families through a ‘thought experiment’ by considering what it would look and feel like to move in to an apartment, which is a typical first home for many of us moving out of our family home for the first time. 9) Be a creator: Start conversations, build relationships, and uncover community resources. In episode #023 Alice Mainland shares the story of her family’s journey to create an ordinary life with her son Michael. What I am highlighting from my conversation with Alice, is the creator mindset that she brought to the challenges that her family faced. You can also support this work by subscribing. You can dive deeper into each of the insights by reading the blog or listening to the full podcast episode for each guest.